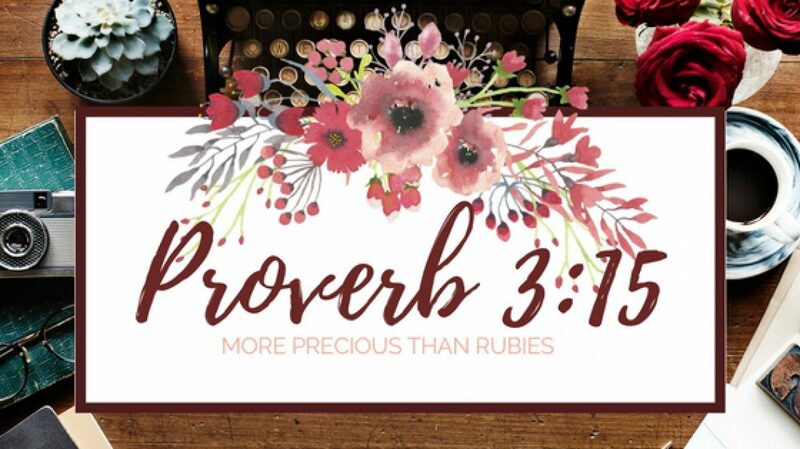 Question – Just wondering why you choose Proverbs 3:15 over Proverbs 31 for the name of your women’s ministry? One, out of obedience to the Lord. It was during a time of prayer that the Lord gave me the name for my ministry. Who am I to go against the word of the Lord? Two, the focus of Proverbs 31 is an example of a godly women. And while I do want my ministry to help women live more like a Proverbs 31 woman, it is not the main focus of my ministry. Proverbs 3:15 is about wisdom. I have spoken with many Christian women over the years that told me they don’t read the scriptures very much, if at all. (I confess, I was once there myself). I have heard it all; I don’t have time, I don’t understand it, I get enough scripture on Sunday at church and the excuses go on and on. The truth is if we are not immersed in the scriptures on a daily basis, then how can we really know the heart of God? How do we know if we are living in obedience to the word of God? How do we know that the messages we are hearing in church on Sundays and else ware throughout the week truly come from Gods word? If the Bible was an unnecessary part of a Christian’s walk then why did God provide it to us? My hope and prayer is that women will choose to make time for the Lord daily. That they will make spending time with the Lord a priority in their lives, not an afterthought or ‘leftover’. That they will immerse themselves in the word and through the process of studying and reading the Bible they will gain wisdom…for in gaining wisdom not only do we draw closer to our heavenly father, we automatically become more like the woman described in Proverbs 31. Do you have an amazing testimony of how Jesus has changed your life that you would like to share with other women? If so please contact me for more information.